Up to this point, I've shared some principles and insights of educators, psychologists, and even neuro-biologists that have proven to be particularly instructive in my own understanding as I've taught thousands of students over the last two decades. These insights are not new. What is new however, is the convergence of the various sciences of cognition, neuroscience, learning theory, and psychology - especially as it relates to emotional development. With this new awareness of learning as something much more than just convergent thinking and data retention, let me describe a research project that I conducted at one of the schools that I taught at 10 years ago. It was a research project based on the study and work that I had done previously in obtaining my Masters of Education degree. The project was done for the purpose of determining if there was a causal effect from utilizing a program of music, movement and play such as I was employing in my lower grade music classes, and the reading abilities of 2nd graders. The school district had, at the time, a reading specialist, and a dedicated computer reading lab. The computers in the reading lab were equipped with the AutoSkill Academy of READING® software, a well-known reading intervention program. At the time, the school also had a credentialed teacher as the reading lab specialist who was trained to administer the 'AutoSkill Academy of READING® program. For the year-long study, the four 2nd-grade classes at the school were divided into two groups consisting of two classes each. To maintain consistency throughout the project, the homeroom classes were kept intact. The four teachers involved were all experienced 2nd grade teachers who had taught together in this district for several years. Both groups continued to receive the standard reading curriculum and instruction that had been approved by the school board. In addition however, both groups of students were assigned 1 hour of instruction time per week for supplemental activities. During the first 1/2 of the school year, students in one of the groups, (Group 2) were given 1/2 hour per week of 'option time' to read books of their own choosing from the classroom grade-level libraries. In some cases this option time could also be used for supplemental math tutoring if the classroom teacher determined this to be a critical need. The second 1/2 hour consisted of the students being sent to the reading lab to receive training on the AutoSkill Academy of Reading program under the guidance of the Reading lab specialist. During this same time, the other section of students (Group 1) received 1/2 hour music classes two days a week in lieu of the option time and the computer assisted reading instruction. I was solely responsible for the content, management, and teaching of these classes. I employed an approach to music education in lower grades that I will discuss in depth in other blogs. I had used this approach at several schools prior to my coming to this school. This approach utilizes Music Movement and Play in a prescribed approach to music education and child development that encourages participation, cooperation, engagement, and interaction. Since I was new to the school at the time, this approach had never been used with these students before. At the end of the first 8 week intervention period, the music classes and the supplemental reading and option classes were suspended. 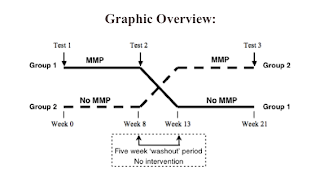 When coupled with the Winter Break, this 'gap' between interventions resulted in a 5 week "washout" period, which provided an effective separation for the 'crossover' aspect of this study. After school resumed in January, the groups were reversed. 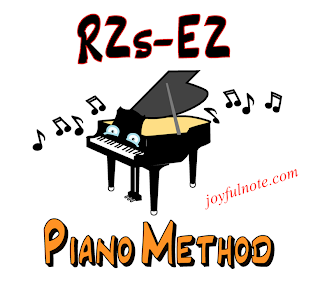 The group which had received no music classes prior to that time, (Group 2) , was given the identical program of Music, Movement, and Play, that Group 1 had received at the beginning of the year. Correspondingly, Group 1 received the same supplemental reading and option program that was used by Group 2 at the beginning of the year. Three tests were administered during the course of this project and the results were recorded and tabulated. All of the students were tested under the supervision of the Reading Lab Specialist using the assessment portion of the AutoSkill Academy of Reading program. A 'pre-test' was administered prior to the beginning of the interventions. Test 2 was administered at the conclusion of the first 8 weeks of intervention and prior to the 'washout' period. Test 3, or the 'post-test' was given at the conclusion of the entire 21 week program. I named the study the RITMMAP study, which is an acronym for Reading Improvement Through Music, Movement, and Play. 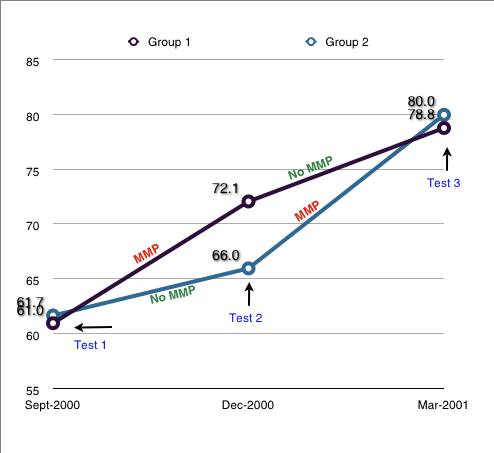 An overview of the RITMMAP study is available here, as are results of the entire study. In future blogs I will highlight some of the more important elements of this study, and discuss what I believe are some of its more important implications for the Arts in education today.